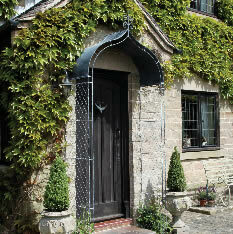 A zinc door canopy or porch can offer the protection we may need during the extremes of weathers here in the UK. As storm season approaches and the visit from Ophelia looming, the arrival of a tropical storm is still thankfully an unusual visitor, however, being prepared is always a wise decision. Door canopies create a warm, inviting welcome to your home; take a look at options in our range including scooped or arched designs or we can create bespoke canopies or porches specifically to fit your doorway or to accommodate architectural features and light fittings.